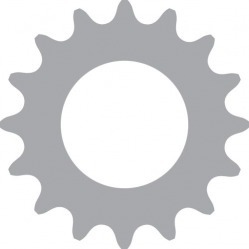 silvercog is a bicycling t shirt design contest website and store. every 3 months (once per season), we will pay $100 (minimum of 250 total votes for all entries in contest for payout to occur) to the winner of a design contest using 3 guidelines. 1 - make any design any way you want using the silvercog logo (to the left - 16 teeth - we will send eps version of silvercog - request at silvercog@gmail.com). 2. make any design any way you want using the word silvercog. 3. make any design any way you want using the word silvercog.net. the winning design of any of these options which gets voted on (click 'view / vote tab - contest' above) will win $100 (250 total vote minimum) and have the shirt go into production to be sold here at the silvercog store. shipping and handling fees: $5 per shirt in u.s.(hawaii, alaska, canada, world - contact silvercog@gmail.com for shipping rates). processing / shipping time roughly 5 - 7 days in u.s.
payment: credit card (you can also pay with a virtual check using paypal). we use paypal to do all of our credit card processing. product info: all designs are currently printed on gildan ultra blend 50/50 8000 series shirts using a sublimation style of print application. this gives a unique slightly faded appearance. certain shirt color options might change the original art design ink colors as they appear on the shirt. how to enter contest: send your orginal art to silvercog@gmail.com using the following guidelines: 1 - make any design any way you want using the silvercog logo (above - we will send eps version of silvercog - request at silvercog@gmail.com). 2. make any design any way you want using the word silvercog. 3. make any design any way you want using the word silvercog.net. send art to us in jpeg (mandatory) and eps / ai (recommended). winning designs get to choose ultimate logo placement and shirt color (request shirt color options at silvercog@gmail.com - silvercog or silvercog.net must appear at least once someplace on the front or back of shirt - you can use an existing house logo or create one yourself). the winning design, which is announced every 3 months (once per season), will win $100 (250 total vote minimum). if a tie occurs in the contest voting, the winner will be determined by the silvercog staff. (must be at least 18 years old to participate in contest). dealer inquiries and all other inquiries contact silvercog@gmail.com. all rules and regulations subject to change without notice.